Hardcoding (or "burning") your subtitles will make them permanently display over the video. While you won't be able to toggle subtitles off during playback, it is a useful technique when you want to send someone a subtitled video and you don't know what platform they'll use to play the video. Hardcoding ensures what you see is exactly what everyone else will see, no matter their setup. If you still want to have the option to disable subtitles, refer to our article What are the different ways to create a subtitled video? 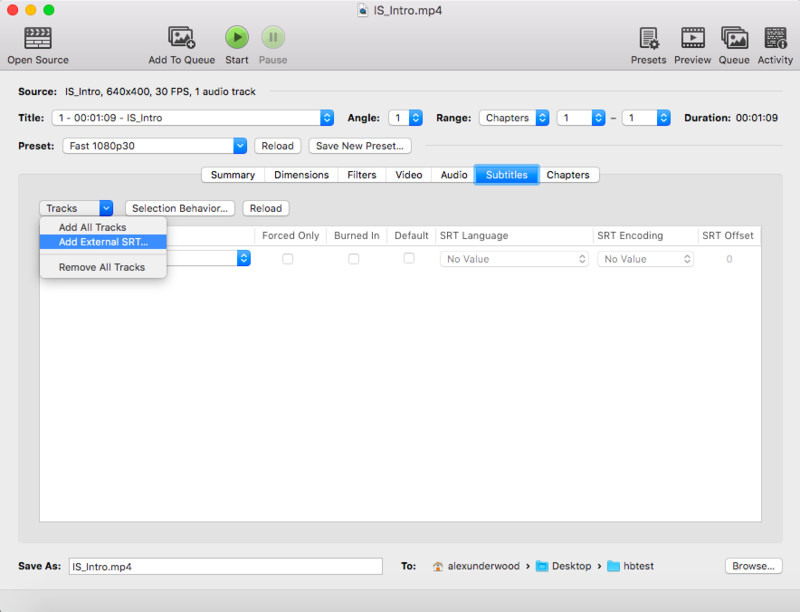 InqScribe cannot hardcode a video by itself, but you can use InqScribe in combination with the free, open source software HandBrake to finish the job. We want to note that HandBrake is not affiliated with the makers of InqScribe. We recommend it because our users have found it reliable over the years. Once you've downloaded and installed the HandBrake software on your Mac or PC from handbrake.fr, follow the steps below. First we'll need to prepare an SRT subtitle file with InqScribe, and then we'll use HandBrake to write it over the original video. In the Export Settings menu, select the "Advanced" button in the bottom left. Set Line Endings to "Windows (CR/LF)" and click OK. HandBrake cannot hardcode subtitles with Mac or Unix line endings, so, even if you're using InqScribe on a Mac, you should choose the Windows option. Choose a destination for the SRT file and click Export. Select "Open Source" in the top left corner of the app and choose the video file you want to receive the subtitles. The hardcoded video will be saved as a separate file, unless you choose to overwrite it down in Step 5. Select the "Subtitles" menu and under the "Tracks" dropdown, choose "Add External SRT". Choose the SRT file you previously exported from InqScribe. When the track loads, check the "Burned In" and select the SRT language. At the bottom of the app window, you'll see the option to name and choose a save location for the new subtitled video file. We recommend renaming the video. If the new video has the same name and location as the original video, it will overwrite it. Click the green "Start" button at the top of the app window and HandBrake will begin creating the new video file. This may take a few minutes, depending on the size of your original video. Once it's finished, test out the new video to make sure everything is correct. If all looks good, you're done! Having issues? If you don't have the option to check "Burned In" in Step 4 of the HandBrake section, make sure you exported the SRT file with Windows Line Endings as described in Step 4 of the InqScribe section. Otherwise, if you're having problems with InqScribe, you can contact us at support@inqscribe.com.